Wireless Packet Core (WPC) market revenues grew 7 percent Y/Y in 4Q 2018, according to a new report from Dell'Oro Group. For the full-year 2018, Huawei was the top-ranked vendor, achieving this annual designation for the first time ever. 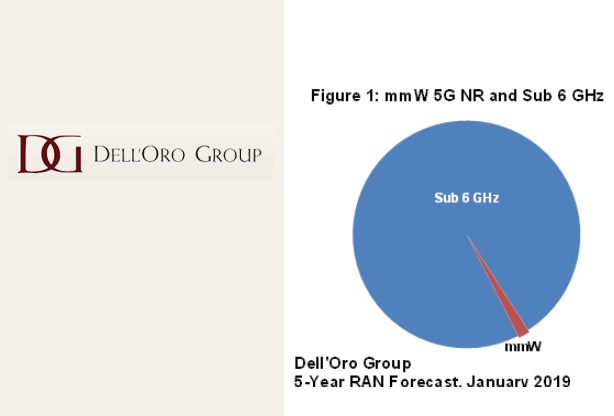 "The modest growth of the WPC market in 4Q 2018 was due to the 4G Evolved Packet Core (EPC) technologies that service providers are using for 4G networks, but also for EPC use in upcoming 5G network deployments," said Dave Bolan, senior analyst at Dell'Oro Group. 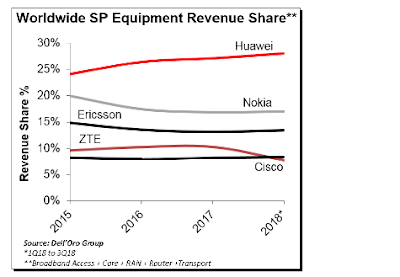 "For 2018 WPC market shares, Huawei was the number on vendor based on revenues; however, Ericsson, retained its first-place ranking for the EPC market that was the largest sub-segment of the wireless packet core market," Bolan added. 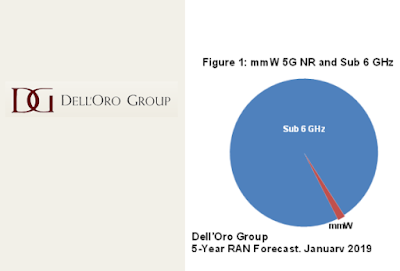 Double-digit growth characterizes Wireless LAN (WLAN) market in 4Q and full-year 2018, despite a soft China, according to a new report from Dell'Oro Group. China sees a comeback in 4Q 2018, particularly Huawei. "The growth of the WLAN market in 4Q and full-year 2018 came primarily from a surge in North America as users refreshed networks with 802.11ac Wave2 products, and opted for extra applications such as higher levels of security, location finding, and cloud-managed," said Ritesh Patel, WLAN analyst at Dell'Oro Group. "We predict 2019 sales to accelerate as WiFi 6 shifts from an early shipment phase to widespread availability, and vendors bring more applications to market targeted at specific verticals," added Patel. Huawei reported a seasonally strong 4Q, a remarkable comeback after its low in 1H 2018 when Chinese Service Providers stopped deploying WLAN in mobile environments. We predict the WLAN market to enter a period when revenue growth out paces unit growth as users opt for higher-featured, higher-priced WiFi 6 products, and applications deployed via cloud-managed license subscriptions. During 2018, cloud managed subscription license revenue eclipsed hardware revenue. SOHO Wireless Router sales rose 20% during 2018, driven by Whole Home Mesh. Cloud-native evolved packet core (EPC) revenues reached new heights in 3Q18 with a 145 percent Y/Y growth rate, according to a recently published report from Dell'Oro Group. Huawei ranked first in revenue share for the quarter, and was followed by Ericsson. "Service providers are moving aggressively to deploy cloud-native EPC for 5G network launches," observed David Bolan, Senior Analyst at Dell'Oro Group. "We see examples of these EPC deployments with the recent announcements of 5G network launches in Korea and the anticipated launch by AT&T in the US by the end of the year." "During the quarter, Huawei moved into first place in vendor rankings as Ericsson slid into second place. Huawei capitalized on the strong subscriber growth in China, adding over 40 million LTE subscribers. Nokia retained its third place ranking and ZTE moved into fourth place rebounding after the end of the US ban," Bolan added. Regional rankings for 3Q18 by sessions was Asia Pacific, Europe, Middle East, and Africa, North America, Caribbean and Latin America. The Wireless LAN (WLAN) market accelerated in the second half 2018, boosted by higher-end products. WLAN prices rise with mix shift to Wave 2, 802.11ax and NBASE-T, according to a new report from Dell'Oro Group. “The WLAN market outperformed in 3Q18, as price erosion slowed. Users opted for feature-rich products, such as Wave 2 access points and premises managed Controllers,” said Ritesh Patel, Industry Analyst at Dell’Oro Group. “This indicates purchases are coming from sophisticated users, which relate to large enterprises upgrading Ethernet switches and pulling along wireless LAN sales. We see the WLAN market entering a period when revenue growth may outpace unit growth, particularly as 802.11ax access points become material. The early to market 802.11ax products from Aerohive, Arris Ruckus, Huawei, and HPE are midrange or high-end boasting NBASE-T Ethernet. It will be a few more quarters before we see lower-end products” added Mr. Patel. Arris Ruckus, Cisco, HPE, and Ubiquiti gained share vs. the year-ago period. Project delays weigh on China—but not for long. 802.11ac Wave 2 access points jumped over 10 points from the year-ago period. The aggregate sales of equipment for Data Center Interconnect (DCI) infrastructure will grow by 85 percent over the next five years, according to a new report published by Dell’Oro Group. The report looks at the infrastructure market from three network perspectives: Optical Transport, Data Center Core, and Wide Area Networks (WAN). DCI will drive strong demand for Optical Transport, Ethernet Data Center Switch, and Routing technologies. Huawei captured a 28 percent share of the telecom equipment market in 3Q18, according to Dell'Oro Group. This represents a 4 percent gain market share since 2015. During this period, Ericsson’s and Nokia’s market share declined one and three percentage points, respectively. For the first nine months of 2018, the top five equipment manufacturers were Huawei, Nokia, Ericsson, Cisco, and ZTE. Combined these five companies accounted for about 75% of the worldwide service provider equipment market revenue. The overall telecom equipment market declined 2 percent year-over-year for the 1Q 2018 through 3Q18 period. Robust demand for Optical Transport and Microwave Transmission equipment was not enough to offset declining Core and Service Provider Router revenues. Huawei’s telecom equipment revenue is nearly as large as Nokia and Ericsson combined. Huawei’s revenue share gains over the past four years have been most pronounced in the Core, Router, and Optical Transport Markets. Following three consecutive years of contracting worldwide Radio Access Networks (RAN) revenues, the overall Mobile Infrastructure market improved at a high single-digit rate in the third quarter—recording the strongest growth rate since 2014, according to Dell'Oro Group. ZTE’s RAN business gained five points share and recovered rapidly in the quarter. The vendor was able to reclaim its number four position during 3Q 2018. Sales of 25 Gbps controller and adapter ports is forecasted to grow at a 45 percent compound annual growth rate over the next five years, according to a new report from Dell'Oro Group, as 25 Gbps advances to become the mainstream speed in cloud and enterprise servers. “25 Gbps has seen a strong initial ramp-up and is now expected to be the dominant speed over the next five years. We have seen Amazon and Facebook as early adopters of 25 Gbps technology, but more end users are transitioning as product availability increases," said Baron Fung, Senior Business Analysis Manager at Dell'Oro Group. "There's been a steady wave of 10 Gbps to 25 Gbps migration as other cloud service providers and high-end enterprises renew and upgrade their servers. Shipment of 25 Gbps ports is expected to peak in 2021, when 50 and 100 Gbps products based on 56 Gbps serial lanes start to ramp-up," said Fung. The total controller and adapter market is forecasted to grow at a four percent compound annual rate, with 25 Gbps sales driving most of the growth. The server market is on track to surge $10 billion higher in 2018 before growth rates taper, according to a new report from Dell'Oro Group. Vendor landscape is trending to lower-cost white box cloud servers. The WLAN market revenue will grow to $18.2 billion by 2022, according to a new report from Dell'Oro Group. Broadband CPE and Mesh routers will fuel growth for SOHO class WLAN. “We estimate the Enterprise and SOHO markets to maintain modest growth over the next five years,” said Ritesh Patel, Business Analyst at Dell’Oro Group. “Specifically in the SOHO market, the need for better Wi-Fi coverage and in-home management will be driven by the demand for improved network visibility and application mobility, i.e. having the ability from anywhere in the home to experience high bandwidth applications such as FaceTime, Netflix, and YouTube. Broadband CPE and Wi-Fi Router vendors will fulfill this need by integrating new wireless technology, 802.11ax, and by improving visibility into analytics and management controls. Similarly, vendors will address the need for better coverage through Mesh Routers, which will continue to see modest to high growth over the next five years,” added Patel. Enterprise Cloud license revenue will surpass Cloud Managed AP revenue for the first time. Ethernet switch sales to aggregate WLAN are poised to eclipse switch sales lost to WLAN. See our Campus Networks Advanced Research report. China eclipses the largest region, North America, in terms of units by 2020.